People are in a constant search for programs that could allow them to edit and mix audio files in order to create unique recordings. Sadly, they are often disappointed with the results they get with faulty online tools. 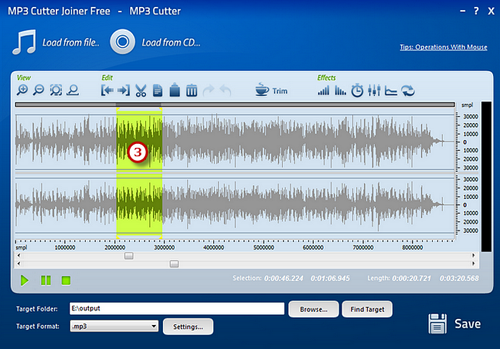 MP3 Cutter Joiner Free is a free and safe downloadable software that give its users top-notch results. This is MP3 cutter software, so you can cut audio files to use them later in your projects. This is also a merging software which allows you to join all the sections you cut to create new audio files. MP3 Cutter Joiner Free supports not only MP3 audios, but also formats such as OGG, WMA, WAV, AAC, and many others. It is a free, safe and easy-to-use software. Why using MP3 Cutter Joiner Free instead of an online cutter joiner tool? Online tools often ask for money to operate, and the results you get are not the ones you would expect. Not all the editing options are usually available, or at least not until you pay a membership. 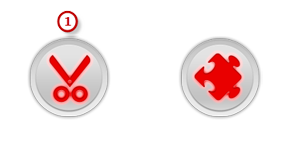 MP3 Cutter Joiner Free is a downloadable software that guarantees high-quality results from the start. Online tools have a lot of ads and links that can lead you to download malware or virus without knowing. 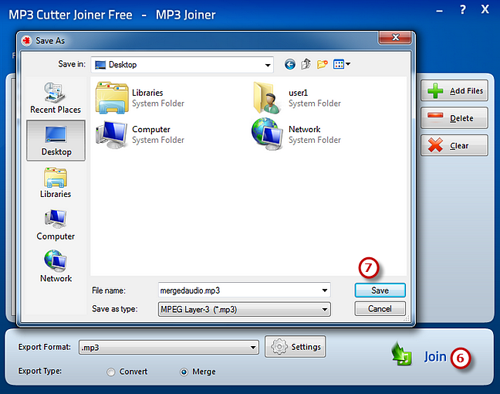 MP3 Cutter Joiner Free does not carry with it a virus or malware that could damage your computer after downloading and launching it. Online tools work separately. 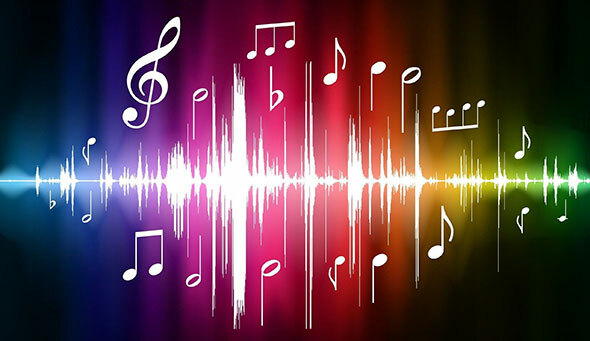 You often find a singular tool for cutting MP3 files, another for joining audio files, editing, and another one for converting a file from one format to another. 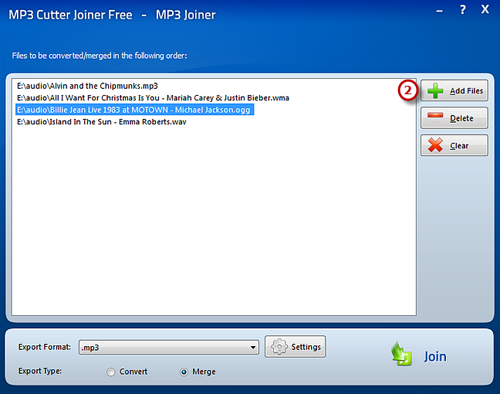 MP3 Cutter Joiner Free is a software that can do all these tasks without the need of further downloads. How to cut and merge MP3 songs with MP3 Cutter Joiner Free? 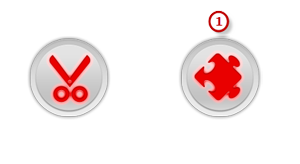 The entire process of cutting and merging an MP3 file is made of 9 steps: cutting is 5 steps and merging is 4 steps more. But before doing these simple processes, you must download this free MP3 cutter software. As previously said, downloading this software is free, so no fee nor payment would be required. Then, you must launch the program. Here is when the steps begin. Step 1. Activate the cutting option. 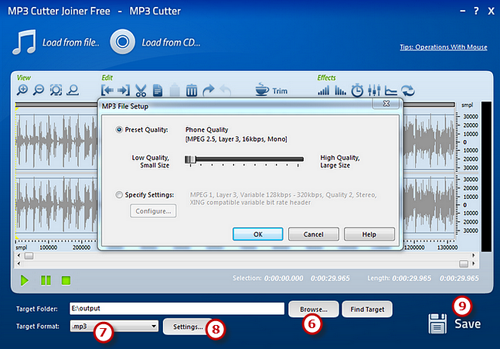 When you launch MP3 Cutter Joiner Free, two options will appear. You can activate the cutting or the merging option. 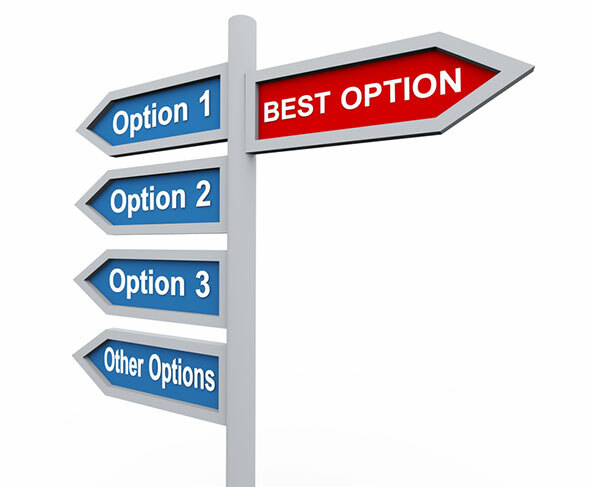 Next, choose the cutting option. Step 2. Select the audio file you want to cut. You can input an MP3 audio file from your computer or a CD. To input an audio file that is on your computer, click “Load from file” and this will activate a browser window where you can look for the folder where the MP3 file is. Finally, click “open” to input the audio file. Click “Load from CD” if the MP3 file you want to cut is in a CD device. Choose the file you want to cut, and click “open”. In both cases, the file you chose will be displayed as a waveform for easier editing. Step 3. Select the section you want to cut. Before doing this, make sure to know where the section you want to cut begins and ends. This will guarantee you no mistakes at the time of extracting the region from the entire audio file. There are many ways for selecting a region of the waveform of an MP3 audio file. The first and most common one is clicking where it begins, and moving the cursor all the way until where it ends, without releasing the left button of the mouse. You could also click the beginning of the section, and then press Shift + Home to select it as the start. Select the end by pressing Shift + End. Step 4. Cut the section you selected. If you want to eliminate the audio file except for the part you just selected, click “trim”. If not, use the other options this MP3 cutter software offers you, such as “cut”, “copy” and “paste”. The “browse” option will allow you to look for a folder to save the audio file you will output. The target format you will use for your new audio file is “.mp3”, but there are other options as well, like “.ogg” and “.wma”. “Settings” option is used to establish the output parameters. You could use the standard options MP3 Cutter Joiner Free has, or you could establish new parameters that meet exactly what you want with the final result you are about to output. Step 6. Activate the MP3 Joiner. After you cut all the MP3 files you are going to join, close the program, and launch it once again. This time, select the merging option. Step 7. Add the audio files you just cut. The “add files” option will open a new window where you can choose all the audio files you just cut and saved. While doing this, select the order of the audio files. If you input a wrong audio, you can delete it and if you want to reorganize the entire list, click the “clear” button and start all over again. Step 8. Select the output settings. Just as you did while cutting the files, you must select an export format (in this case, “.mp3” once again). The “settings” option will open a new window where you can check the standard output settings, and change them if you desire to do so. Click “ok” to save the standard or new settings. Finally, choose the “join” option at the bottom of the window, so the software can join them. Step 9. Join all the audio files. Click the “join” button if everything is ready. After you clicked that option, a new window will emerge. Choose a folder, and click “save”, so this MP3 cutter software starts to do what it does best – working efficiently and flawlessly. Download for free and use MP3 Cutter Joiner Free, and start achieving those results you could not get with online tools. Cutting, editing, converting and merging MP3 files have never been easier.